Re: Double-dish bubbler pics, yo! How can I make a hole in a mesh lid? AwesomeHermit wrote: How can I make a hole in a mesh lid? Metal shears. Bolt cutters. Be careful of the edges of the mesh - plan to bend them back when you're done, or coat/cover them with something so they won't poke you and/or tubing. I'd wear Spectra gloves or something else puncture proof/resistant. Regular leather work gloves may not work so well, but it's better than nothing. 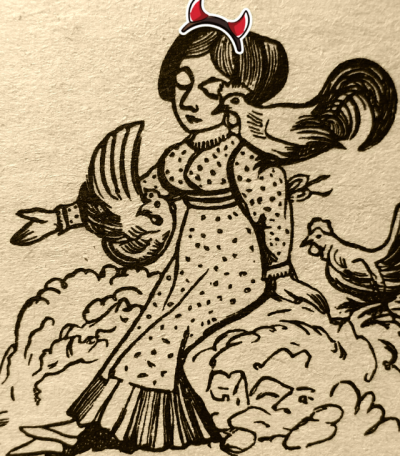 Cotton cloth gloves are not sufficient. 4PPs and tons of FUN in a 29 gallon! Good writeup! if needed, happy to sticky if theres enough interest. You mean like how I turned myself into a bloody mess trying to put holes in my turtle's lid? I kept wondering why there was red paint smearing everywhere. Yay neuropathy! Seriously though, just go slow and be careful. It is wire mesh, so the little wires can be all stabby when cut. You put the lid on top of the bowl with water and stones? What is the bottom bowl with rocks for? is this the fresh water pool?? LadyJinglyJones wrote: Hopefully I'm not just repeating a better, pre-existent post, but I thought I'd throw up a quick referrence as to the visual how's of a bubbler system in a double container-pool. We recommend this all the time, but I've noticed it baffles newbies - unsurprisingly! 1. 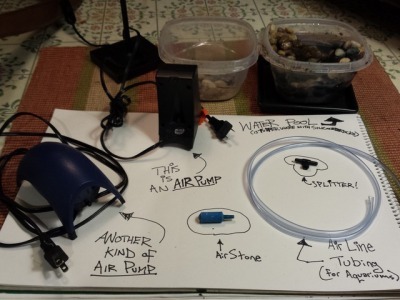 An air pump... stores or online places that sell aquarium stuff will have these. Some are noisier than others. 2. Air tubing. Also aquarium supplies. 3. Air stone... different shapes exist... all will get the job done, so don't stress. 4. A pair of nesting containers: food containers work well. Optional: a splitter or fancy gang valve for turning an air line for one pool (fresh or salt) into a bubbler for two pools (both fresh & salt). Ask people how best to do this, it's easy, but opinions vary. 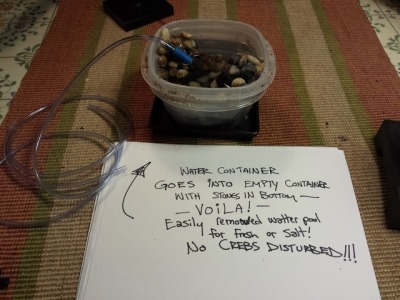 Then put rocks (or whatever) in the container that wont have water in it... bury it in the sub. Next, take the container that will have water in it, and place this container in the buried one. Add bubbler, plug in, and voila! Improved humidity - just make sure the lid is good & sealed, or your humidity will escape!! Fantastic tutorial, LJJ!! And the title of the topic was awesome Caught my attention for sure! ciaraalston wrote: You put the lid on top of the bowl with water and stones? No. They're talking about the lid on the tank. And you would want to double each pool so when you take it out, the sand retains its shape in case a crab has tunneled underneath. So it's easier to remove if there are a couple of pebbles in the bottom of the bottom container. And you want to make it easy for them to get in and out of the pool, so you would put rocks in the bottom and a ramp. That's just how I have my pools set up... I used stones glued together (with aquarium safe silicon) as a ramp out of the pool. 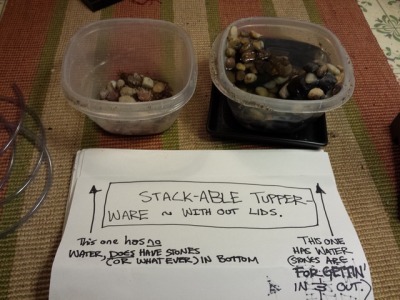 The loose stones in the bottom of the other container are to make removal of the water container easier because tupperware nests very snugly & so loose stones in the bottom one make gripping the top one easier. The lid I referred to is just the tank lid. Awesome!! This is a very simple, yet perfect set up and I can't wait to upgrade my tank again and get this in there. I'll show pics in a few weeks! Thanks so much! One thing I haven't read about in this thread is the importance of using check valves on your air lines if you're using a bubbler. Check valves prevent water from siphoning back through the air line into the pump in the event of a power outage or shutoff. Not using a check valve can cause a flood in a power failure as the water is siphoned out of your tank, and the water will go back into the pump and destroy it. Note that some brands of pump contain a built-in check valve, this will be indicated on the box. The black upright Aqueon pumps have them. I once lost two pumps, a tank full of fish, and a hardwood floor because of a power outage while I was at work because I didn't know to use check valves. Check valves only cost a dollar or two at your local fish store, but they can save you a lot of money in the event of a power outage. You need one for each air line. 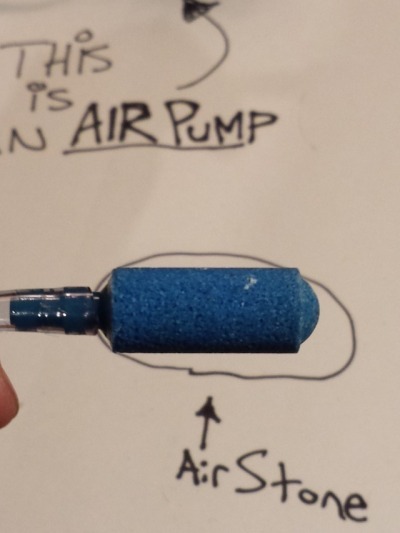 They do not affect the flow of air, they just prevent water from backing up through the line to the pump. Iraj wrote: One thing I haven't read about in this thread is the importance of using check valves on your air lines if you're using a bubbler. Check valves prevent water from siphoning back through the air line into the pump in the event of a power outage or shutoff. As long as your air pump is above the level of where the dishes sit check valves shouldn't be necessary because it is such a small amount of water and the line is usually barely submerged. I've lost power several times and never have had any issue with water siphoning up the line. But yes, if you do have your pumps sitting at a lower level than where the water bowels are, then they would be a good idea. When I lost the pumps and my floor was destroyed, both pumps were sitting on top of the tanks. I always thought that keeping air pumps above the water line would prevent the water from backing up into the pump in a power outage. For many years I didn't use check valves because I thought I didn't need them. I guess it must depend on how much air pressure is in the air lines. 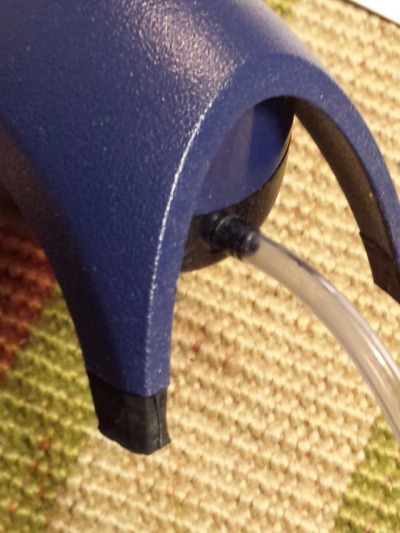 If you're using a more powerful air pump, that will be a factor. 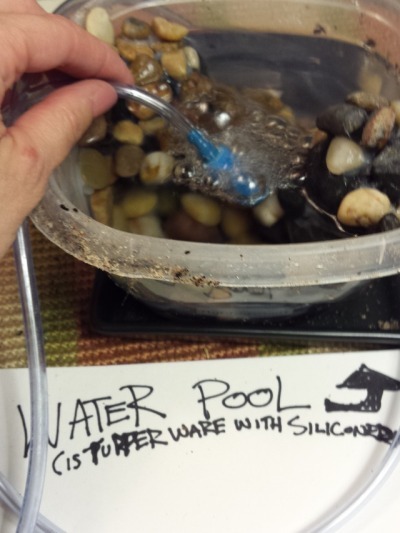 For a crabitat where you're only using a pump as a bubbler for small water dishes you would be less likely to experience a backup of water because there's less water to begin with. In my case it was a 40 gallon fish tank, and not only was a siphon formed that forced the water back up into the pump, it siphoned almost all of the tank water onto the floor during the night. If you have a large crabitat with more water, that would increase the chances of a water backup. In any event, it's up to you whether you feel the need to use check valves. I'm suggesting it as a bit of an insurance policy, but they're not mandatory. They cost less than $2 each in any pet store. I'd rather spend $2 than have to go out and buy new pumps and mop up a lake from the floor. Again, you're talking about gallons and gallons of water. They're certainly optional for use in crab tanks, but not really necessary or mandatory. Most people have maybe 2-4 cups of water in each dish.